Wasn’t it just yesterday that you mastered your baby’s car seat installation? And now your pediatrician has given you the OK for her to ride facing forward, which means breaking out the instruction manual. (Too bad the seat doesn’t come with built-in GPS for locating that misplaced guide…)If you had your hands on the Combi Zeus 360, this wouldn’t even be an issue. This convertible car seat is designed to rotate 360 degrees without requiring you to re-install it. With so much attention as of late on keeping toddlers rear-facing as long as possible, this car seat accommodates rear-facing babies up to 33 lbs. (and up to 40 lbs. for forward-facing), so you can breathe a little more easily that your child is staying safe and secure. And hey, now you don’t have to find that instruction manual after all. 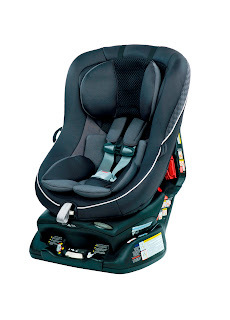 In a Nutshell: Living up to its name, this god of all things car seats is not only solid, but it is packed with standard features like a 5-point harness and energy-absorbing foam for added insulation and protection.